PARK SLOPE — Neighbors lining up against a proposed nightclub where customers could guzzle bottle-service booze until the wee hours say their movement is gaining momentum. The group Prospect Place Neighbors, who've been battling since March against plans for a new lounge called Kemistry at 260 Flatbush Ave., have won support for their cause from state Assemblyman Hakeem Jeffries and the nearby Grace United Methodist Church. "It's wonderful," said Prospect Place Neighbors member Barbara Kurka. "They recognize that this business is not appropriate for the neighborhood the way it's currently presented." The church's pastor and Jeffries recently filed letters with the State Liquor Authority asking that the SLA weigh neighbors' worries when it reviews Kemistry's liquor license application, which hasn't been filed yet. "It seems clear that neighbors have valid fears as it relates to excessive noise within a close radius of some completely residential, family-oriented blocks," Jeffries wrote. State Sen. Velmanette Montgomery and Assemblywoman Joan L. Millman also wrote to the SLA voicing concerns about Kemistry in April. Kemistry's street address is 260 Flatbush Ave., but the lounge would have a back entrance on Prospect Place between Flatbush Avenue and Sixth Avenue, a tree-lined residential block. Neighbors say a nightclub that would hold up to 225 customers, play live music and stay open until 2 a.m. doesn't make sense on their quiet street. Kurka said she was "appalled" when she first found out about Kemistry's plans. She said she and other neighbors aren't "anti-business" — they just want an establishment that's more in keeping with their block's low-key character. 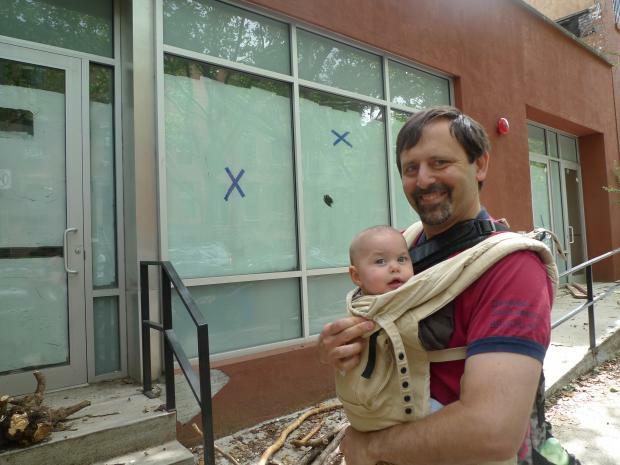 "Not every street has to be full of bars; there are other businesses that could go here," said Raul Rothblatt, a father of two walking past Kemistry's planned Prospect Place entrance on Tuesday morning with his 7-month-old baby, Eli. "And look at this, this is a quiet street," said Rothblatt, pointing to the homes flanking the proposed Kemistry site. A family with two young girls lives to the right, and a woman and her elderly father live on the left, Rothblatt said. Rothblatt, who lives in the next block of Prospect Place and was wearing a shirt with the slogan "develop don't destroy Brooklyn," said bottle service and late-night crowds wouldn't mix well, because pedestrian accidents were already common on busy Flatbush Avenue. Opponents say Kemistry would be the only club in Park Slope or Prospect Heights offering bottle service — where patrons pay up to a few hundred bucks for an entire bottle of booze. A bar called Prime 6 that was slated to open on Flatbush Avenue and Sixth Avenue planned to have bottle service, but after neighbors objected, the venue switched business models and ultimately opened as Woodland, a pricey restaurant specializing in high-end meats like braised rabbit. Park Slope's Community Board 6 in April rejected Kemistry's bid for a liquor license, but the community board's role is only advisory. The State Liquor Authority has final say. Kemistry owner James Brown could not be reached for comment. Brown told Patch earlier this month that he didn't know when he would file Kemistry's liquor license application, but he intends to "move forward" with the business.